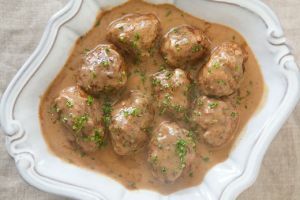 Kjottboller | Meatballs is a Norwegian food recipe baked in a sauce of creamy mushrooms and beef broth. Mix meats, salt, mustard, mace, pepper and milk. Form into balls of desired size; they will be soft. Brown in butter or place on broiler pan to bake in oven (350 degrees F) until done. Stir together soups in a large baking dish and simmer briefly. Add meatballs and bake at 325 degrees F for an hour or until flavors are blended. Makes approximately five dozen meatballs.